I enjoyed a visit to Bletchley Park with my kids on Saturday. It's an amazing place. It just reeks of World War II and the Cold War. And it has so many fascinating stories to tell. The place was abuzz with the latest news - that 92 year old Bletchley codebreaker Raymond Roberts had been appointed an MBE in the New Years honours list. 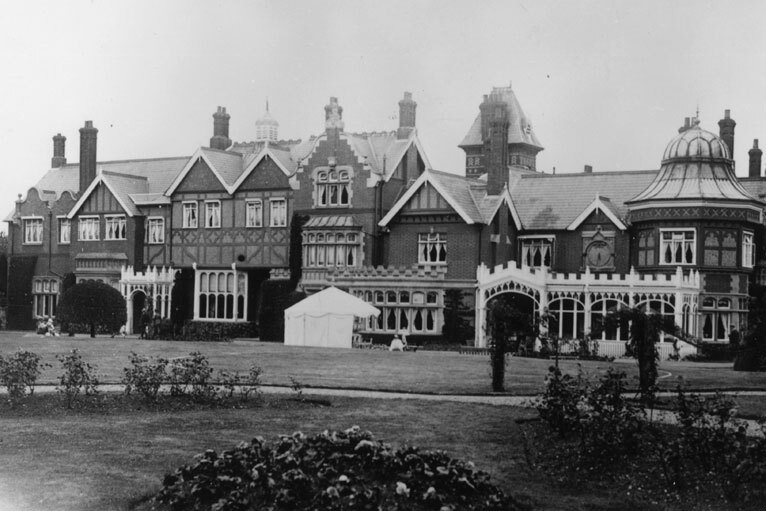 Bletchley's activities are reckoned to have shortened WW II by 2 years, yet nobody but a select few knew what was done there until the mid-1970s when the Official Secrets Act restrictions were lifted. 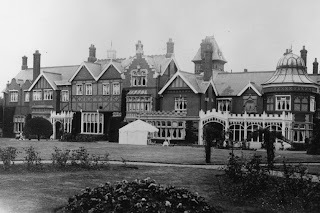 Such was the secrecy that husbands and wives did not know that they each had worked at Bletchley in their younger days until they cautiously mentioned their past to each other in the mid-1970s. Bletchley Park (near Milton Keynes, in Buckinghamshire) was Britain's main decryption establishment during WW II; the home of the Government Code and Cipher School (GC&CS), known as the Golf, Chess and Cheese Society by outsiders who can have had no idea of the work truly going on at Bletchley. Ciphers and codes of several Axis countries were decrypted including, most importantly, those generated by the German Enigma and Lorenz machines. This was achieved in equal measure by brainpower and by the invention and use of Colossus - the world's first electronic, digital, fixed-program, single-purpose computer . The secrecy around Bletchley's activities meant that the Axis countries were unaware that their seemingly unbreakable codes had indeed been broken and British military commanders and politicians were reading Axis messages within hours of them being sent. A senior member of the Bletchley war-time team was Alan Turing. Turing was part of the team that cracked the Nazi Enigma code, vital to the allied war effort. He is now widely recognised as a computing pioneer. However, at the time of his death - which an inquest recorded as suicide - he was virtually unknown to the public. His work at Bletchley Park was kept secret until 1974. 2012 celebrated 100 years since Turing's birth. 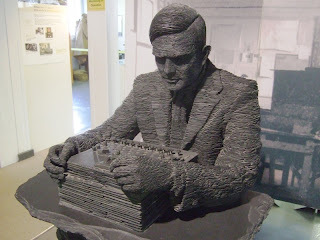 There's a wonderful sculpture of Turing at Bletchley, made entirely of pieces of slate by Stephen Kettle. The picture I've shown here doesn't do it justice. It's well worth a trip to Bletchley just to see this sculpture. Amazing work! 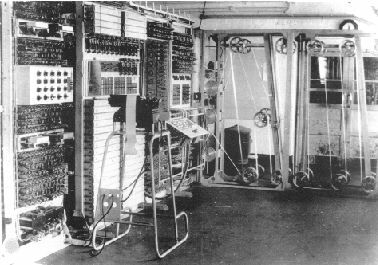 The Automatic Computing Engine (ACE) was the product of Turing's theoretical work in 1936 "On Computable Numbers" and his wartime experience at Bletchley Park with Colossus. In early 1946, Turing presented a detailed paper on ACE to the National Physical Laboratory (NPL) Executive Committee, giving the first reasonably complete design of a stored-program computer. However, the Official Secrets Act prohibited him from explaining that he knew that his ideas could be implemented in an electronic device. ACE implemented subroutine calls and used Abbreviated Computer Instructions, an early form of programming language. Turing's colleagues at the NPL, not knowing about Colossus, thought that the engineering work to build a complete ACE was too ambitious. Turing was a homosexual, at a time when homosexuality was illegal in Britain. Turing was convicted of gross indecency in 1952 after acknowledging a sexual relationship with a man. Barbaric as it seems by modern standards, he was offered (and accepted) treatment with female hormones ("chemical castration") as an alternative to prison. Turing died in 1954, from cyanide poisoning. An inquest determined that his death was suicide. An incredibly tragic life story. In 2009, Prime Minister Gordon Brown made an official public apology on behalf of the British government for "the appalling way he was treated". In 2012, there has been a growing campaign to grant Turing a statutory pardon. In a letter to the Daily Telegraph on 14th December, eleven of Britain's leading scientists called on the government to grant the pardon. I'm looking forward to receiving my copy of Dr Sue Black's Saving Bletchley Park book later this year, describing the amazing people and amazing work done at Bletchley over the last 70 years, including efforts in recent years to stop the bulldozers and save the site for the nation. The BBC History web site has a wonderful section on Bletchley (including video). Bletchley Park is highly recommended for a visit, and so is the BBC web site!